Each situation will be unique, but the goal is universal: empowering advisors, clients, and family members to minimize the financial risks related to cognitive decline by planning ahead. We can’t predict, but we can better prepare. Editor’s note: Many thanks to State Street Global Advisors (SSGA) for permission to republish an abbreviated version of their excellent white paper, “The Impact of Aging on Financial Decisions.” Proactive Advisor Magazine will present the white paper in two parts: Part I appears below, and part II will appear in our April 27 issue. Proactive Advisor Magazine is dedicated to promoting and educating the advisor community on active investment management. We publish a variety of articles related to many facets of client portfolio construction and management, strategic and tactical tools for advisors, and the importance of risk management and diversification. However, we recognize that, as important as the benefits of dynamic, risk-managed investing are to our audience, successful advisors also need to take a holistic view of risk management across all aspects of their clients’ lives and the lives of their families. Perhaps nowhere is this more important today than in recognizing and addressing the unique challenges facing an aging population in the United States. Just as hope is not a viable investment strategy, it is also not a viable strategy in addressing the financial needs of older clients facing cognitive decline. According to SSGA, only 39% of investors have a suitable plan in place should their financial decision-making abilities become diminished. We hope you find valuable insights for your practice and your clients in the following paper. Ask 10 investors what risk management means to them and you could get 10 answers that all focus on market risk, even though most have never hedged their exposure to market risk. On the other hand, few investors would mention the potential risks associated with cognitive decline, despite the fact that most fully intend to live long past the time that financial capacity—the ability to manage your money to meet your needs and match your values—starts to decline. Why are investors avoiding confronting this risk, which will likely impact them, and how might this affect their family members and their financial advisors? We all strive for a long, healthy, and meaningful life, but investors rarely plan for how their financial decision-making abilities could change over the long term. Investors who aren’t prepared for this change are vulnerable to real threats, including family conflicts, expensive legal action and devastating financial fraud. In other words, their interests may not be safeguarded. Advisors with clients who are unprepared for changes in their financial decision-making abilities also face risks, including emotionally charged confrontations, loss of business from disgruntled clients and family members, regulatory actions, and even lawsuits. Fortunately, risks can be managed proactively and even avoided entirely simply by developing a plan before it is ever needed. Investors can’t predict the markets, but they can determine how their financial interests will be protected if their own decision-making abilities start to decline. All too often, investors are uninformed or in denial about the realities of how cognitive abilities decline as we age. That can lead to a Catch-22 for advisors who face legal and business risks when clients are experiencing cognitive decline but it’s too late to implement a plan because of their diminished state. Broaching the topic of cognitive decline can be difficult for an investor as well as their advisor. It’s important for everyone involved, including family members, to appreciate that age is simply a number. It shouldn’t represent a constraint or limitation. Advisors who are mindful of the challenges we all face as we age can apply a strengths-based approach to the conversation, building on the client’s own experiences, wisdom, patience, family support, and other resources. 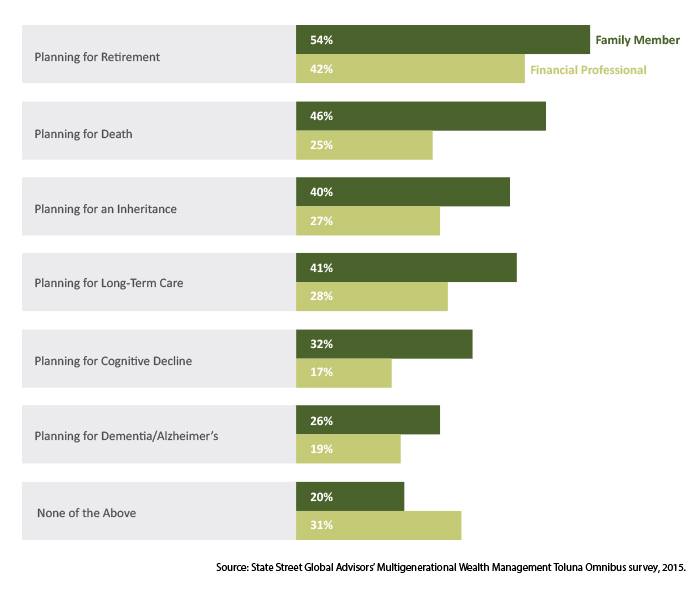 In our recent study, “Not Just a Number: Perceptions and Behaviors Related to Cognitive Decline and Financial Decision Making,” which builds on our June 2015 “Money in Motion” survey, State Street Global Advisors conducted in-depth research by collecting quantitative data and gathering qualitative insights. Our comprehensive approach included surveys and interviews with individual investors, financial advisors, and subject-matter experts from the financial-services industry and academia who specialize in psychology, health care, finance, wealth management, industry regulation, and family law. Our objective was twofold. First, we wanted to understand how investors and advisors believed cognitive decline and the aging process related to investing attitudes and behaviors. Second, we wanted to identify proactive measures for advisors to help protect their clients and better understand the connection between money mistakes and cognitive decline to minimize age-associated financial vulnerability. Deciding to “cross that bridge when I come to it” will leave investors with less-desirable options and outcomes, and their families and advisors with more stress and risk. As our population continues to age, cognitive decline is set to become one of the most challenging intergenerational issues facing the investment industry. Since the financial crisis, the focus of financial advice has been squarely on saving for retirement; little attention has been paid to how cognitive decline could impact investors and their families. There are 45 million people 65 and older, representing 14% of the U.S. population—and within 10 years, this segment will grow to an estimated 66 million. According to the U.S. Census Bureau and the Federal Reserve Survey of Consumer Finances, today they hold $100 trillion of wealth worldwide (calculated with mean net worth by age). We gained nearly three decades of longevity in the 20th century, mostly through biomedical advances. Are we prepared for what this could bring in terms of extra years of age-associated financial vulnerability? Neuropsychology can help us address this question by shedding light on how aging impacts our cognitive abilities, including how we make financial decisions. There are two forms of intelligence: fluid and crystalized. Cognitive performance consists of these two neural systems. Fluid intelligence, which generally peaks at around age 20, describes the ability to learn and process information, and to solve abstract problems quickly. 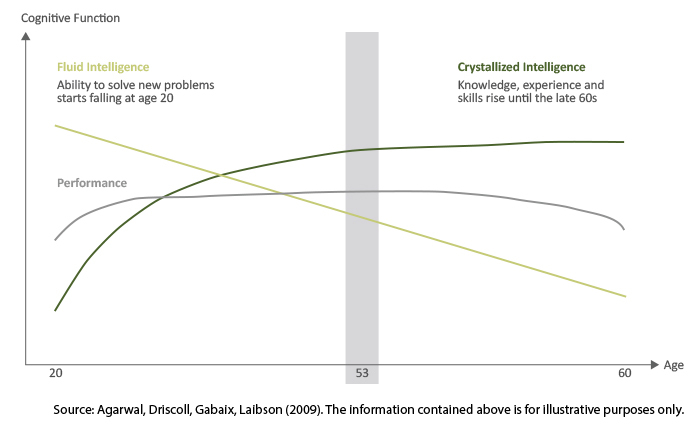 Crystalized intelligence—which is defined as wisdom, experiential knowledge and learning by doing—usually continues to improve before leveling off in a person’s late 60s. 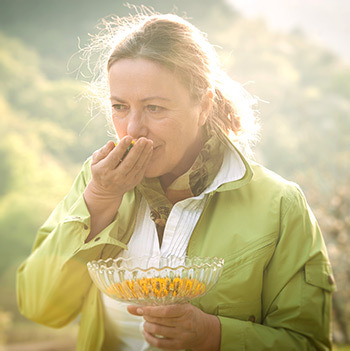 This is around the time that the first signs of cognitive decline typically arise. They become more commonplace in the 70s and even more prevalent in the late 80s. Decision-making ability is at its peak, and designs for effective intervention and decision aids across the remainder of the financial journey can proactively be put in place. Steps to improve financial literacy can still be taken, as knowledge and experience accumulated from past decisions can help offset age-related cognitive decline. They are approaching retirement, planning for decumulation, and anticipating future financial-planning needs. They are becoming acutely aware of the need to protect their plan—and themselves—because they start to see the impact of cognitive decline on friends and their own family members. Starting early can also help depersonalize the conversation, since both the advisor and the investor can speak more objectively. The conversation is about “potential cognitive decline” and is focused on the distant future. Because it’s not a reflection of the client’s abilities, there isn’t the same stigma attached. It is important to understand that these age benchmarks are generalizations, including the broad range of basic cognitive skills and financial knowledge that they reflect. The age at which cognitive decline begins varies by individual, and it progresses at different rates (Smith et al. 2010). And, while it’s never too early to manage the potential risks related to cognitive decline, the age at which it becomes too late may be sooner than expected. Question asked: Which of the following topics, and how it concerns or affects you, have you discussed with a family member/financial professional? Mild cognitive decline, dementia, and Alzheimer’s disease are all related but distinctively different types of cognitive decline. We can think of them as a spectrum of conditions, all of which are diagnosed symptomatically. Some people may only experience mild cognitive impairment; for others, this condition is a precursor to dementia. Anyone experiencing changes in memory, decision-making, or other thought processes should be evaluated by a physician. If diagnosed with any form of cognitive decline, they should be re-evaluated regularly to determine whether their symptoms are changing and whether there are any treatments that could slow the progression of the condition. Assessment typically includes medical history, memory tests, mood assessment, and other measures. It’s important to remember that discussions of cognitive decline can be fraught with anxiety—whether the condition is mild or more severe, age-related or the result of an illness. Advisors and family members should be sensitive in approaching the topic. Alzheimer’s disease and dementia are ranked as the scariest among six age-related debilitating conditions (compared with arthritis, diabetes, heart disease, stroke, and cancer), regardless of the age of the respondent (Merrill Lynch 2014). Fortunately, there are often treatment programs, and certain lifestyle changes can lower an individual’s risk, improve existing symptoms, and slow down the progression of the condition. According to the Alzheimer’s Association, these include exercise, adequate sleep, diet, stress management, mentally stimulating activities, and social engagement. There are also abundant resources on the topic, including the Alzheimer’s Disease Center, The Center for Healthy Aging, the National Institute on Aging, alzheimers.gov, and the Alzheimer’s Association. According to the Financial Industry Regulatory Authority (FINRA), older Americans are more likely to be targeted by fraudsters and are more likely to lose money once they are targeted. In the U.S. alone, financial fraud among the elderly is estimated at nearly $3 billion, although it’s possible that even this massive figure is understated because of underreporting (Metropolitan Life Insurance Company 2011). The broad category of financial fraud includes financial scams (perpetrated by strangers) and financial abuse (committed by friends, family, neighbors, and service workers). Investors who begin to experience cognitive decline but have no plan for financial decision-making are the most vulnerable to financial fraud. Some research suggests that susceptibility to fraud may be more directly related to overconfidence (which can be a function of cognitive decline and age) than it is to age. For nearly four decades, State Street Global Advisors (SSGA) has been committed to helping financial professionals and those who rely on them achieve their investment objectives. SSGA partners with many of the world’s largest, most sophisticated investors and financial intermediaries to help them reach their goals through a rigorous, research-driven investment process spanning both indexing and active disciplines. With trillions* in assets under management, their scale and global reach offer clients access to markets, geographies, and asset classes, and allows SSGA to deliver thoughtful insights and innovative solutions. State Street Global Advisors is the investment management arm of State Street Corporation. *Assets under management were $2.47 trillion as of December 31, 2016. AUM reflects approximately $30.62 billion (as of December 31, 2016) with respect to which State Street Global Markets, LLC, (SSGM) serves as a marketing agent; SSGM and State Street Global Advisors are affiliated. FINRA and the U.S. Securities and Exchange Commission are two organizations in the United States that are examining the advisor’s responsibility in situations of financial abuse. These organizations develop training programs to help advise and protect clients from financial fraud and provide protocols for what to do when a client is victimized. For example, one model is to have an aging specialist within the firm serve as the go-to person for issues related to cognitive decline and financial fraud. There are also several organizations dedicated to this issue, including the National Center on Financial Elder Abuse and the National Council on Aging, the latter of which has developed a list to help increase awareness and protect individuals. For details on these scams, go to https://www.ncoa.org/economic-security/money-management/scams-security/top-10-scams-targeting-seniors/. Editor’s note: Please see our April 13 issue for part II of this white paper, “The Impact of Aging on Financial Decisions,” which will offer practical guidance to advisors, their older clients, and their clients’ families on the issue of dealing with cognitive decline and its impact on investment planning and decision-making. Please visit https://www.ssga.com/investment-topics/defined-contribution/2016/The-Impact-Of-Aging-On-Financial-Decisions.pdf for a full version of the white paper, which includes acknowledgments, sources, and credits. The opinions expressed in this article are those of the author and do not necessarily represent the views of Proactive Advisor Magazine. These opinions are presented for educational purposes only.The information provided does not constitute investment advice and it should not be relied on as such. It should not be considered a solicitation to buy or an offer to sell a security. It does not take into account any investor’s particular investment objectives, strategies, tax status or investment horizon. You should consult your tax and financial advisor.